When Should You Contact Your Doctor or a Sleep Specialist About Obstructive Sleep Apnea? If your snoring is loud enough that it disturbs your, or your bed partner's, sleep on a regular basis. If you have regular intermittent pauses in breathing during sleep. If you often wake from sleep because of shortness of breath or difficulty breathing comfortably. If you have chronic morning headaches. If you are feeling excessively sleepy during the day or often fall asleep at inappropriate times. If you schedule an appointment with your primary care provider or a sleep clinic, you should begin keeping a "sleep journal" about 2 weeks prior to your visit. In the journal, document your nightly sleeping habits and behaviors. Write down things like: what time you went to bed, what time you woke up, how often you awoke in the middle of the night, how rested and alert you felt the next day, how sleepy you felt during the day. Ask your bed partner for input regarding your sleeping habits as they may have noticed some of your nocturnal activities that you may not have been aware of. If you're aware of any family history of OSA, make sure to mention it to your doctor, as obstructive sleep apnea can be hereditary. Figure out when your symptoms began. Have they always existed? Did your symptoms increase or begin as you aged? Did your symptoms increase as you gained weight or stopped exercising? Physical Examination. In some cases a doctor may administer a simple check of your mouth, throat, and neck to determine if you have OSA. In these physical examinations the doctor is looking for abnormalities or excessive fatty tissues of the uvula, tongue, soft palate, or checking for enlarged tonsils and adenoids. With children, doctors often only need a physical examination to determine that tonsils and adenoids are the cause of obstructive sleep apnea. Polysomnography (PSG). If your doctor believes you may have moderate to severe OSA, he will probably refer you to a sleep specialist for a sleep study. During the sleep study, you will spend the night at a sleep clinic where you will be hooked up to diagnostic machines that measure and record your heart, lung and brain activity, breathing patterns, arm and leg movements, body positions, and blood oxygen levels while you sleep. These tests are painless and non-invasive and generally take six hours to complete. Home Sleep Test (HST). If you live far from a sleep clinic, uncomfortable sleeping away from home, or can't afford the full in-lab PSG sleep test, an HST might be best for you. While not as in-depth of a study as a PSG, an HST is a test that you can take home overnight for a similar assessment. An HST monitors airflow, respiratory effort, breathing patterns, blood oxygen levels, and even body positions. The information is either transmitted wirelessly to the sleep clinic, or stored on a memory card for later drop-off. Depending on the severity of your obstructive sleep apnea, your doctor or sleep specialist may recommend some remedies ranging from lifestyle changes to therapies or surgical procedures. For those with mild OSA, a few lifestyle changes may be all that is needed in helping you get back to having regular restful sleep. For those with moderate to severe OSA the lifestyle changes will still be helpful but coupled with other treatments. Diet and exercise. Being overweight or obese increases the likelihood of acquiring OSA. Larger people have more fatty tissue built up in the throat and thicker necks that aid in choking off the airways during sleep. Reducing the fatty tissues through routine diet and exercise can have a dramatic positive impact on the quality of one's sleep. Cut back on alcohol consumption. This is important especially before bedtime. Alcohol relaxes the throat muscles allowing them to collapse into the airways and cause an obstruction. Not drinking alcohol 3 hours before bedtime can help alleviate the likelihood of blockage. Quit smoking. Smoke is an irritant that causes inflammation of the sensitive tissues in the throat and lungs producing swelling of the tissues that aid in obstruction. Sleep on your side. Sleeping on your back at night permits your tongue and throat muscles to relax easier and fall backwards into your airway. For those with mild OSA, simply changing sleeping positions can relieve obstructions. Positive Airway Pressure (PAP). The majority of OSA sufferer's symptoms are often relieved through the use of a PAP machine. PAP machines are devices that use masks that fit over the wearer's nose, nose and mouth, or full face and deliver a gentle force of air that pushes past the blockage to allow for easier breathing at night. There are 3 kinds of PAP machines for differing needs, but the CPAP therapy is the most common. Continuous Positive Airway Pressure (CPAP). A CPAP device includes a breathing mask that sleep apnea sufferers wear when sleeping. Just enough consistent air pressure is delivered via the mask to the patient's airways to keep the tissue that otherwise would collapse (and cause breathing pauses and snoring) from closing during sleep. CPAP devices are effective in treating sleep apnea but do not cure the disorder. If you discontinue using your CPAP device, your sleep apnea may return. Automatic Positive Airway Pressure (APAP). Automatic, or autotitrating, positive airway pressure adjusts to the air levels sleep apnea patient needs throughout the night. An APAP can detect if the patient’s apnea is spiking and increase the air pressure, then decrease the flow if the sufferer is at a peaceful, non-snoring state. APAP therapy is useful for people who can’t get comfortable with a CPAP’s air pressure, or for people with seasonal allergies whose breathing might be affected at different times during the night. Bilevel positive airway pressure (BPAP). Bilevel positive airway pressure is similar to CPAP except that BPAP adjusts the level of air being delivered depending on whether the patient is inhaling or exhaling. During inhalation, an electronic sensor tells the BPAP to send more air through the mask to clear the apnea-causing obstruction. When the user exhales, the air pressure is reduced. This decrease is helpful for sleep apnea sufferers who have a rough time breathing out against the constant pressure of a CPAP machine. Adaptive-servo ventilation (ASV). The Adaptive-servo ventilation device monitors breathing and adjusts air flow appropriately through the mask to match how the patient would be normally breathing if awake. This adjustment can be made quickly as soon ASV detects that the patient is not breathing correctly (as is the case with central sleep apnea, when the brain doesn’t signal the body to take a breath). When the patient exhales or after the patient resumes a normal breathing pattern, ASV adjusts the pressure again. Mandibular advancement devices. Often used for snorers, mandibular advancement devices (MADs) also can be helpful in curbing sleep apnea. MADs look like sports mouthguards and push the lower jaw down slightly, just enough to pull the tongue forward and help open the air passage. Tongue-retaining mouthpieces. Also common as a snoring treatment, tongue-retaining mouthpieces are worn in the mouth and change the position of the tongue during sleep. The flow of air through the user’s mouth becomes less obstructed and may help lessening obstructive sleep apnea. Some patients find wearing a PAP machine's mask or using an oral appliance too inconvenient. Most often it's because they have difficulty wearing a mask on their face, a device in their mouth, or find the pressure of air blown into their nose throughout the night uncomfortable. For the non-compliant, surgical alternatives for obstructive sleep apnea may be a practical alternative. Uvulopalatopharyngoplasty (UPPP). A procedure in which soft tissues in the back of the throat are removed. The tissues removed are from the uvula (the little soft flap of tissue that dangles in the back of the throat) and parts of the soft palate. If tonsils and adenoids are still intact, they are often removed as well. Adenotonsillectomy. Surgical removal of enlarged adenoids and tonsils is usually the first-line of treatment in children with obstructive sleep apnea. Nasal Surgery. For OSA sufferers whose symptoms are often caused by a deviated septum, the straightening of the nasal passages or removal of the deviated cartilage can help free up the blockage causing snoring and OSA. Maxillomandibular Advancement (MMA). In this surgery, upper and lower parts of the jawbone are moved forward. It creates an enlarged space behind the tongue and soft palate, making obstructions less likely. obstructive sleep apnea, it may be recommended that the patient undergo a tracheostomy. In this surgical procedure, a permanent opening is made in the throat to the windpipe where a breathing tube is inserted. The breathing tube has a valve that is closed during the day for regular breathing and speaking, and opened at night. When opened during sleep, air enters the lungs through the tube rather than through the upper airways allowing airflow to bipass the obstruction by entering beneath it. What Can Happen If My OSA is Left Untreated? It's important that you address your OSA symptoms early to avoid any further health complications that can arise from untreated obstructive sleep apnea. These complications can range from the severe and potentially fatal to mild or moderate daily nuisances. Greater risk of coronary artery disease. Greater risk of heart attack or heart failure. Greater risk of having a stroke. Daytime fatigue. Untreated OSA keeps your body and mind from getting a full night's sleep as you continuously wake because of breathing obstructions disturbing your sleep. This leaves sufferers feeling tired and groggy throughout the day. People with untreated OSA have a higher likelihood of work related accidents and driving related accidents resulting from lack of restful sleep at night. Complications with medications and surgery. Medications such as sedatives, narcotic analgesics, and general anesthesia all aid in relaxing your upper airways that can further complicate your OSA. 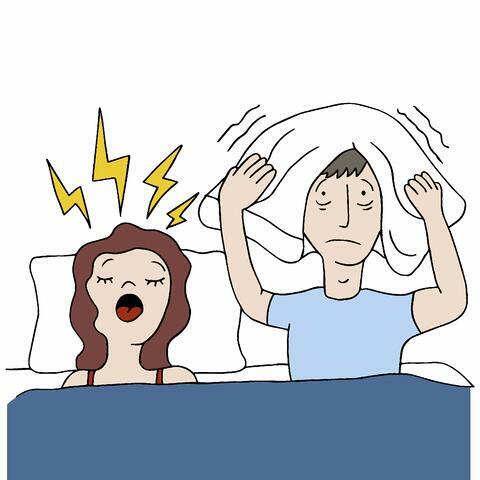 Morning migraines due to reduced blood oxygen in the brain at night. If you have any questions or concerns regarding obstructive sleep apnea or any other sleep related questions, feel free to contact The Alaska Sleep Clinic for further information and be on your way to getting the nightly rest you need.